Over 1500 Pages! This disk contains virtually every piece that Beethoven wrote for solo piano: all 32 Sonatas (including Moonlight, Pathétique, Waldstein, Appassionata), 5 Concertos, Choral Fantasy, Triple Concerto, 19 sets of Variations, Bagatelles including Für Elise, Sonatinas, Dances, Rage Over a Lost Penny, and more. Editions used are from catalogs of Peters, Breitkopf & Härtel, G. Schirmer, C. Fischer, G. Ricordi and others. A great reference, with many unfamiliar works to explore. 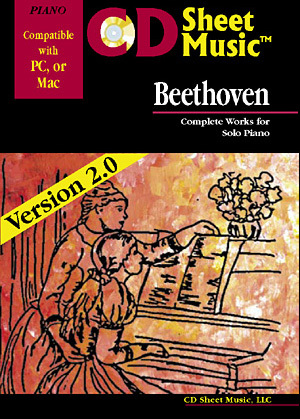 Version 2.0 adds articles on Beethoven and Piano from the 1911 edition of Grove's Dictionary of Music and Musicians. Over 1900 Pages! This disk contains study scores of all of Beethoven's orchestral works: every symphony, concerto and overture. Study score CD's are also available for Bach, Brahms, Mozart and Tchaikovsky. 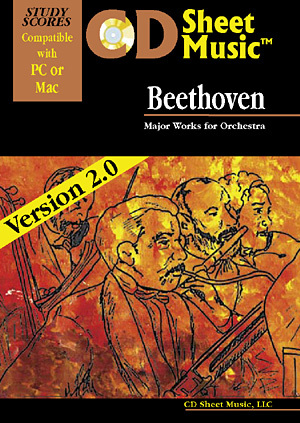 Version 2.0 adds articles on Beethoven and related articles from the 1911 edition of Grove's Dictionary of Music and Musicians. ...add a collection of 13 audio CDs for only $84.95 extra! The 9 Symphonies, 11 Overtures, 5 Piano concertos, Violin Concerto, Triple Concerto, Wellington's Victory and 2 Romances for Violin. Our price: $113.90 + $10 shipping for first item, others $6 each.